Ahead of Star Wars Celebration, we get our first new Star Wars Black Series reveal from Hasbro. 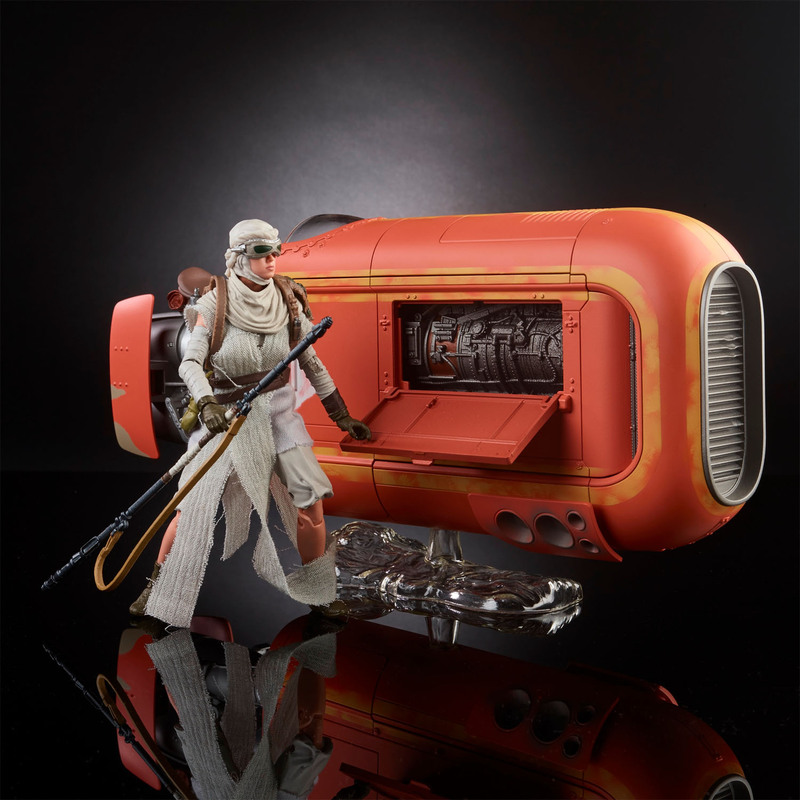 Over at io9, they have shred photos and details for a Star Wars: The Force Awakens – Rey with Speeder 6″ Scale Deluxe Set. 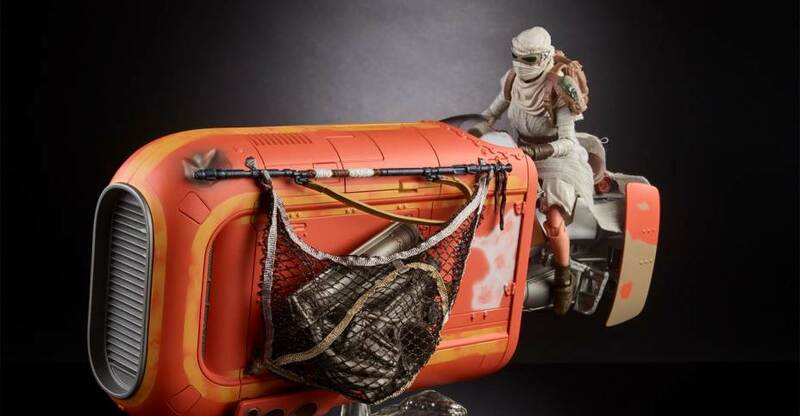 The Rey figure comes in her scavenging outfit from Jakku. The outfit is fabric and Rey has 28 points of articulation, her staff, a satchel and a removable mask. 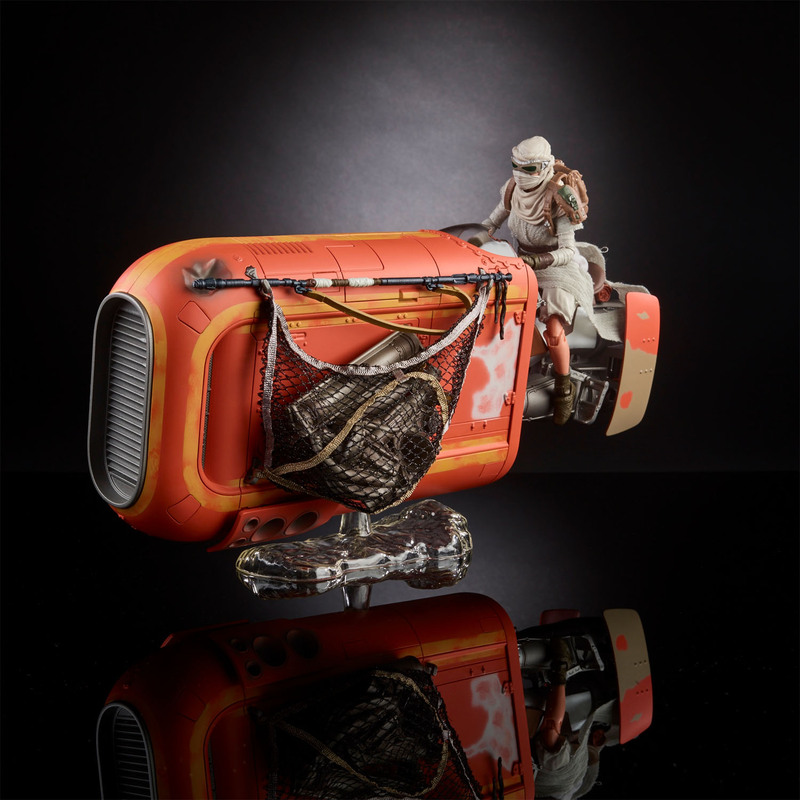 The Speeder has multiple points of interaction, including opening panels and a themed base. 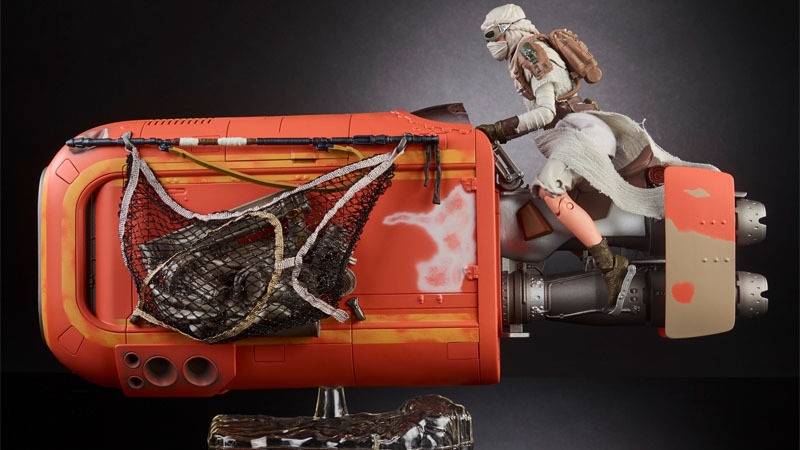 The Rey with Speeder Deluxe Set is due for release i nthe Fall. It will be priced at $60. check out some photos after the jump. I'm a fan of how Rey was introduced, but to pay for softgoods and a speeder I probably won't see again? Sadly a pass at that price. Plus, when I can get Rey with BB-8 and a lightsaber for $10 it's no question. Nice. Can we get some six inch scale Marvel vehicles? Noice. I'm glad Hasbro is doing more vehicles and I love the sharp details on the figure. Great looking set! If every other expensive thing that Hasbro has put out lately is any indication, you'll be able to pick this up for $30-35 after a few months, maybe less. Those 12" Marvel Legends sold for like $50-60 MSRP I think? They all dropped to under $20 at one point on Amazon. And the Tie Fighter went from $165 to I think $80-100? So there's plenty of room for the price to drop. When are we gonna get a super articulated Resistance outfit Rey from Hasbro? Any scale is fine... just so tired of seeing Rey in her scavenger outfit. Or are they saving that for The Last Jedi toy line. Looks good. Am praying for a 6" scale AT-ST as a tie-in to Rogue One. Awesome, definitely getting this. So much for the theory that the 6" TIE sold so badly Hasbro wouldn't make another 6" vehicle too. Would Disney's die cast work? I'm excited for this, not only because it's cool in and of itself, but also because it shows that Hasbro hasn't abandoned making TBS6" vehicles, even if they won't do one quite as large as their FO SF TIE Fighter for a while. It also gives me hope for a ANH Landspeeder, as that one's about as big as Rey's speeder flipped on its side. Hey, thanks! I don't know why I never clued into these before. This is exactly what I had in mind. So much for the theory that the 6" TIE sold so badly Hasbro wouldn't make another 6" vehicle too. It's not really the same thing though since this isn't a big starship, it's a single person land vehicle. Until they do an X-wing then it does seem like they've taken the lesson from the TIE fighter that the spaceships don't really work in 6" scale. This is kinda cool though because it means that stuff like the Landspeeder isn't entirely out of the question or maybe even a Dewback. Can she see where she is going? True, but that nuance was lost on people who were saying we would never see another 6" vehicle again with no distinction for the size of the TIE. I certainly wouldn't be surprised if we don't see another TIE sized ship again (though I wouldn't bet on it), but I do expect to see an ANH landspeeder and other small vehicles like this from time to time. In terms of increased articulation, this one at the very least has double-joint knees, while the original Rey had elbro joints for knees. and a speeder I probably won't see again? To be fair, you could basically say the same thing about Luke's Landspeeder, yet no one brought that up when the Black Series Luke's Landspeeder was revealed.